Keep Jesus as the center of your Christmas celebration. Oh, how we need Jesus as the world shakes and people search for stability, strength and hope. Reach out and minister to those God sends your way by keeping Jesus as the forefront of all you do! 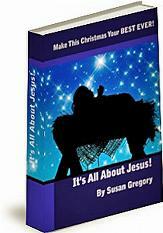 It's All About Jesus is packed with tips, ideas, systems, tools and inspirational messages designed for members of the body of Christ. Just $8.95 and available for immediate download. What's the true meaning behind the popular song, "The Twelve Days of Chrsitmas?" Click on the link below to learn the spiritual roots of this cheery song and allow the Holy Spirit to minister to you as you learn the meaning behind the lyrics. Christ redeemed us from the curse of the law by becoming a curse for us, for it is written: "Cursed is everyone who is hung on a tree." 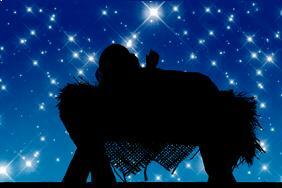 In the Christian church year, Christmas is not just a day, but a season. The season of Christmas starts at sunset on December 24th. The first day of Christmas is December 25th and then the season concludes on January 5th. 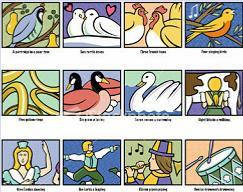 There are twelve days in this season, and that's where the popular song - the Twelve Days of Christmas - got its name. Incorporating the Christmas Season into your holiday (holy day) celebration has a host of benefits. I think the biggest is that it takes the pressure off of trying to cram so much activity into one single day! While our culture celebrates the birth of Christ on December 25th, it's not likely the actual day of His birth. Instead, we can open our hearts to the amazing event of the Word becoming flesh and entering our world so we can be reconciled to our Creator. Surely, a season of celebration and thanksgiving is appropriate! With so many demands and the "disappointments" that can happen if you aren't with a loved one on December 25th - remove the pressure by celebrating the season! For example, enjoy the first day of Christmas at your home with your immediate family. But then make plans to celebrate the seventh day of Christmas with your sister or your mother-in-law who lives out of town. Extend the joy, the love and the celebration by incorporating the Season of Christmas into your plans. A special blessing in taking the pressure of just one day (December 25th) is experienced when you have adult children who what two sets of parents to please and their own families to nurture. Or in families that have experienced divorce - setting aside the "who gets the kids for Christmas" and instead coordinating the days in the Season and not just the one single day! So consider celebrating the Season of Christmas with your family and friends - and then enter into the Epiphany where we look to the light of Christ being sent out into the world!